With stainless steel chamber (21 kg/cm.sq. 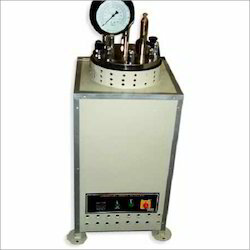 Pressure) The autoclave is suitable for conducting accelerated soundness tests on cement or the autoclave expansion test requiring constant steam pressure with the correspondent constant pressure. It consists of a stainless steel cylinder with a welded heat insulated voer, mounted on a sturdy supporting frame, enclosed in a heat insulated metal housing, attractively finished. The attached control unit encloses a sensitive pressure regulator and pressure gauge, power switches and pilot lights for controlling the electric heating units. Supplied complete with test bar holder, special rack to hold specimens above the water level in the autoclave and in a vertical position to expose them in the same manner.